In this thriller, Susan Wolf Johnson delivers an ambitious, sprawling melodrama about the bitter end of a Southern patriarch and the damage a family can inflict on itself for generations. The novel is firmly rooted in the time, place and culture of 1973 Tampa Bay, Florida, around the time of the (real-life) Gasparilla Pirate Festival. Modeled after Mardi Gras, this distinctly Floridian celebration allows the town’s high society to throw lavish parties, elect kings and queens, and celebrate their “krewes” during a massive parade. On the eve of the festival, one of the town’s most well-known rogues, Daniel Westcott, has gone missing. His disappearance leaves dark repercussions for his clan, including his bitter wife Natalie, slightly barmy daughter Julia, and troubled grandkids Becca and Kurt. 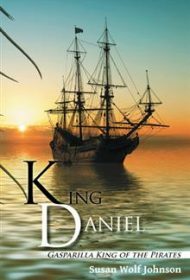 Eventually, it’s revealed that the inveterate gambler has lost the family fortune and gotten involved with a drug smuggler, although whether Daniel was an accomplice or a kidnap victim is never fully established. It’s in the secondary plot that plausibility starts to wear thin. Becca (already coping with an unwanted pregnancy, unearths a trove of diaries that slowly reveal the long, complicated history of her troubled family. With its machinations, family secrets, a sudden revelation about a long-lost family member and the occasional unreliable narrator, this subterranean plot becomes convoluted and farfetched. Additionally, the prose becomes overwrought from time to time. “It was the blood!” Johnson writes. “Bound to secrecy! All those Westcotts have hidden lust, and pirates, and babies and mothers… Now another masquerade was about to take place. Wasn’t there anyone who could stop this?” That said, Johnson’s rich language is perfectly suited to the novel’s tone and theatrical dialogue. While the novel won’t appeal to all thriller fans, readers who enjoy a bit of soap opera that sometimes recalls pulpy classics such as the gothic fiction of V.C. Andrews will likely find rewards in this tale.